Near the centre of Havelock North this oasis is a lovely place to curl up and contemplate the environment. Sit back, relax and have a glass of wine in this lovely destination or stroll in the native garden. From here you have the opportunity to visit local beaches, sample the wine from the local wineries, eat out at some excellent cafes and restaurants, visit the farmers' markets or partake in any number of activities that this area has to offer. Walking tracks are just 5 minutes away on foot (of course), bicycle hire is 5 minutes the other direction. Or just curl up with a book and a wine under the cafe style umbrella or in front of the fire. A short stroll gets you into the centre of Havelock North where you can enjoy all the opportunities and avoid driving. This Amiria Kiddle designed house was completed in October 2013. The house was a finalist in the 2016 ' Best by Design' Golden Piwa awards. 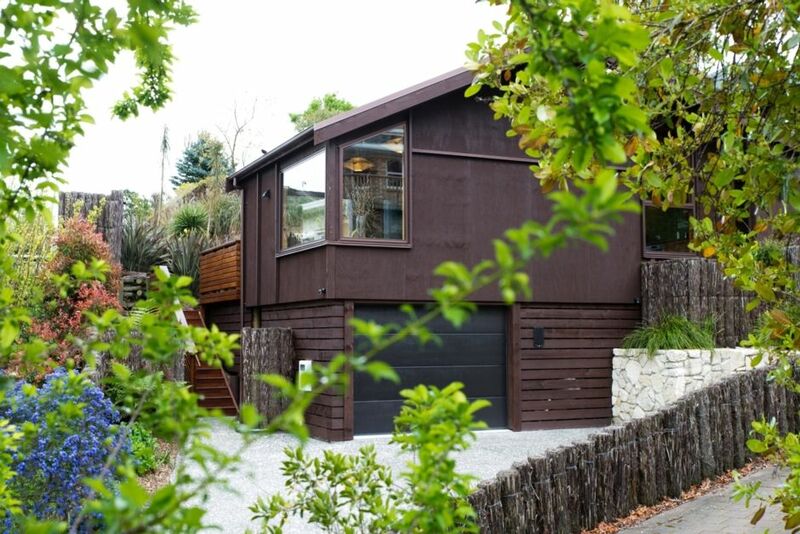 This house offers a garden designed by Jamie McPhail featuring New Zealand native plants and has many quiet spots for reflection and lovely decks facing north and west. Entrance to the house not suitable for people with walking aids. 8 Internal and 8 external steps between levels. Air conditioners in living area and upstairs queen size bedroom only. Children under 18 with prior approval. No smoking in the house or on the property. Reasonable cleaning is provided - if we have to do several hours of cleaning an additional charge will be applied. ($25/hour for every hour after 4 hours). Warm open plan interior with integrated entertainment areas. Two large bedrooms and a smaller third. toilet, combination tub/shower, Heated floor and towel rack. On the roadside (Private Road) or on the drive. Details on the welcome card and the bottom of the modem. Kitchen is part of the open living area and close to the entertainment deck. Smart Television and DVD player. Small garden. No lawn or playing space. Outdoor table setting and insitu umbrella. Thanks for having us - it's a beautiful, cozy home and in fantastic condition. Easy walking into town and a lovely space in which to relax. Really enjoy the closeness to town. Is well presented. Hopefuly be back again. This is a beautifully presented and obviously much-loved home situated a short walk from Havelock North town. We very much enjoyed our stay and loved the attention to detail that meant we really had everything we needed to feel at home. The home is beautifully designed and spotlessly clean. Many thanks and we hope to stay again. Wonderful property. Beautifully clean and well equipped. Had a wonderful stay. Thanks so much! A beautiful house in a great location! You can walk into the cute town in a few minutes. The house itself was perfectly clean with a great kitchen and deck area. The bed was comfortable and the house decor was brilliant! Not one bad thing we could say about the place!